I'm only seeing a blinking cursor: "_" from the USB boot. How do I install Windows Server 2012 to a RD 230 ThinkServer? Rufus was used to create the USB thumb drive; GPT was selected. Because I was getting "boot device failed", I tried from a Tiny Lenova. What BIOS settings would allow this from an RD230? 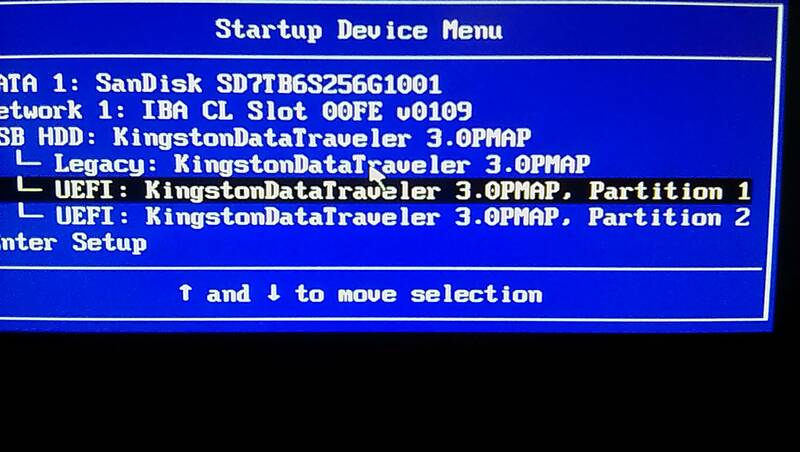 I've disabled Legacy Mode on the RD230 and selected the Kingston as the first boot device. There's a RAID controller as well. Browse other questions tagged boot bios uefi windows-server-2012 rufus or ask your own question. How to install Windows on GPT disk without UEFI BIOS? How can I manually partition and provision a Windows 8 USB install drive with UEFI bios and GPT scheme? Do I have to reinstall UEFI Windows in Legacy to dual boot with another Windows in Legacy? why arcane legacy steps to boot from USB with GPT and UEFI?